I MUST admit the idea of using a 'tablet' as my workhorse didn't really grab me. 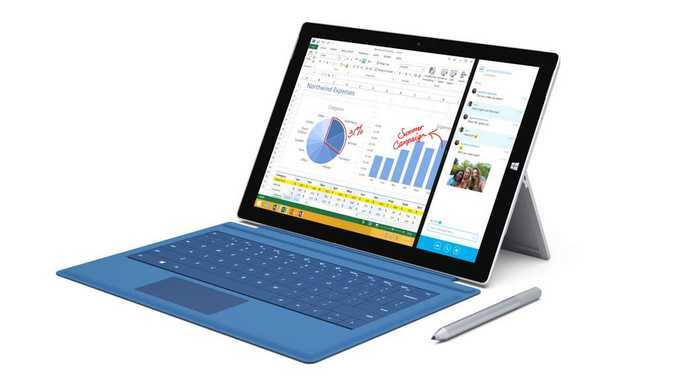 But after playing with Microsoft's Surface Pro 3 in recent weeks, I could easily change my mind. Microsoft has nailed it with this lightweight device which combines the fun of a tablet with the functionality of a laptop computer. 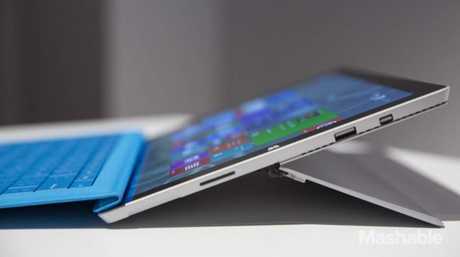 The tech giant is cleverly marketing the Surface as a lighter and much more powerful alternative to MacBook Air. The device features a vivid 12.1 inch 2160 v 1400 pixel touchscreen which is very easy to use, especially if you are accustomed to Windows. The built-in kickstand makes it easy to set up as a laptop while the optional $150 Type Cover squeezes a full size keyboard into a cover that clips (with a super strong magnet) to the tablet. Set up on a table, the keyboard is easy to use, though the keys are a little shallow, though easy to navigate, even for bigger fingers. What is a little more difficult is when you have it on your lap. It can be a little too flexible at times, particularly if you are prone to moving around or fidgeting. But after a while, you get the hang of it. The Surface Pro 3 comes with a cool pen which allows you to do everything from writing notes or marking up Word docs to painting with some pretty nifty apps. One great party trick is being able to open up a blank OneNote document with a click of the pen. It works even if your device is in sleep mode. One of my favourite uses of the pen was the sketch app which allows you to take a picture on your tablet and then convert it to a variety of sketch formats. You can also 'colour in' everything from drawings to artwork - which is something that will appeal to the kids. When it comes to games, apps and Windows programs, there is a massive library available. You can easily run PC games, including League of Legends, Civilization V, and The Elder Scrolls Online. You can also connect an Xbox 360 wireless controller for Windows to your Surface and hook up to your big screen TV to play your best PC games. As a device which combines business and pleasure, there's a lot to like about it. The screen size, which is bigger than the 10.6 inch from its predecessor, is great for viewing photos, video and browsing the internet. Weighing in at under 800 grams (without the keyboard) and with a thickness of 9mm, it is amazing to think that it has an Intel Core I5 processor under the bonnet with 8GB of SDRAM and a 256GB solid state drive. With a full 64-bit Windows 8.1 operating system, you can run the full version of Office and all the other Windows programs you like. The battery life is not as good as some other products on the market with most testers getting around 6 hours of regular use. If you are just web browsing you will get up to 9 hours. The Surface arguably offers better connectivity than a MacBook Air with a full-size USB 3.0, microSD card reader and Mini DisplayPort.